Here are a list some everyday English idioms and their origins. Please feel free to add more to the thread! “Turn a blind eye” - meaning to refuse to acknowledge a truth that is commonly known. It is commonly thought that the origin of this phrase comes from the actions of British Admiral Horatio Nelson, who was blind in one eye. In 1801 he led the attack alongside Admiral Sir Hyde Parker in the Battle of Copenhagen. At one point, Parker communicated to Nelson through flags that he should retreat and disengage. Nelson had others plans - he was convinced they could prevail if the pushed onwards. He held the telescope to his blind eye and pretended not to see the signal - he then made a comment to a fellow officer about “reserving the right to use his blind eye every now and again”! “Feeling under the weather” - meaning to feel unwell. This phrase is also nautical in origin. When a sailor was feeling ill, he would protect himself from adverse weather conditions by going beneath the bow (the boat’s front). Therefore, he was literally below the bad weather that could worsen his state. “Beat around the bush” - to circle around the point. This is thought to have originated in British game hunting. When hunting birds, participants would draw out the birds by disturbing - or beating - the bushes. Thus they were beating around the bush before getting to the real point of the hunt: to capture the birds. “Read the riot act” - to admonish someone for their bad behaviour, with the hope to improve it. This idiom is thought to have come from the real Riot Act which was passed in Britain in 1714 to prevent rowdy gatherings. King George I and his government feared being overthrown by supporters of the previous Stuart dynasty, so if crowds had more than 12 members, law enforcers could read them the Riot Act. If they didn’t disperse they could be imprisoned. So when someone is behaving in a particularly recalcitrant manner, we “read them the riot act” to prevent their unruliness. “Spill the beans” - to share a secret. This is my favourite one - however there isn’t actually a definitive answer to the origin of this phrase. General consensus has it that it’s most likely derived from an Ancient Grecian voting system which actually involved beans! It is said that people would vote by placing beans in a vase; the ‘yes’ bean was white and the ‘no’ bean was black or brown. If someone were to knock over the vase and spill the beans, the election results would be revealed earlier than intended. Therefore, spilling the beans is related to exposing secret information. “Quintessentially British” - epitomising British culture. Ironically, no matter where I looked I couldn’t find the first use of this phrase, despite it being used many times to describe the other idioms! If anyone can enlighten me that’d certainly quell my curiosity. In addition to the four elements of earth, water, air and fire, there was supposed to be a fifth one which was the material of the heavens and which was supposed to be latent in all things, if only you could refine them enough to find it. It is commonly thought that the origin of this phrase comes from the actions of British Admiral Horatio Nelson, who was blind in one eye. 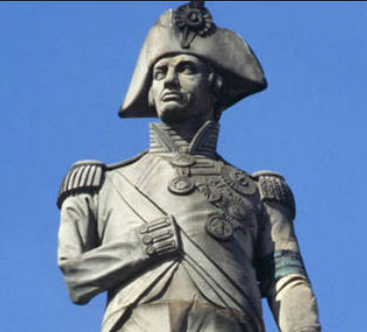 Wasn't it established that Nelson was NOT in fact blind in one eye, and that he used a patch to hide disfigurement? I don't think so. In fact this article claims the exact opposite - that Nelson was not disfigured, didn't wear an eye-patch, and had difficulty persuading the Navy to pay him a disability pension for the loss of sight. The Riot Act was formally repealed in 1973, with provisions rrtsined in the Public Order Act of 1986. Until just now when I googled the text, I was under the impression that the person reading it out could end with the threat of the assembled soldiers firing on the mob, but it seems I was wrong. So that's where the elves got it from! It was in the Book of General Ignorance and I think on the show, too, no? You were right. The Act did not say specifically that soldiers may fire into the crowd, but that was the effect. In short - 'Arrest them, but if you kill them you will not be punished nor sued'. A volley of musket fire can be more effective to disperse a crowd than trying to arrest a hundred individuals, so with this licence to kill, that is what was done. A riot is a fearsome thing, where man turns into a pack animal. Under the cover of a crowd, a man may commit acts he would never do if he thought he would be recognised and held to account, so in that respect the 'Do what you want' issued to justices of the peace really just reflects the licence the rioters give themselves. It is a suspension of civilisation though and we are well rid of it. Wow thanks for the corrections, everyone. It turns out the Encyclopaedia Britannica does NOT know all!